City life has its own undeniable energy. At night, this energy takes on a different perspective. That is when a skyline really comes to life. This is particularly true right now of the Abu Dhabi skyline on the corniche which continues to evolve. 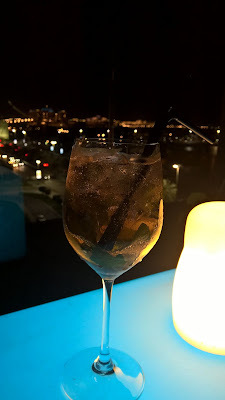 I had the pleasure this week of visiting the Azura Panoramic Lounge at St. Regis Abu Dhabi to see first hand how that energy is transformed at night. As I make my way to the Lounge, I stop for a moment and turn around. The facade of the St Regis Hotel looks breathtaking, with its Presidential suite suspended between the two towers. Night time energy. The lounge is vast and to my elation, it is tiered. I love levels. I think they really do something for a venue. 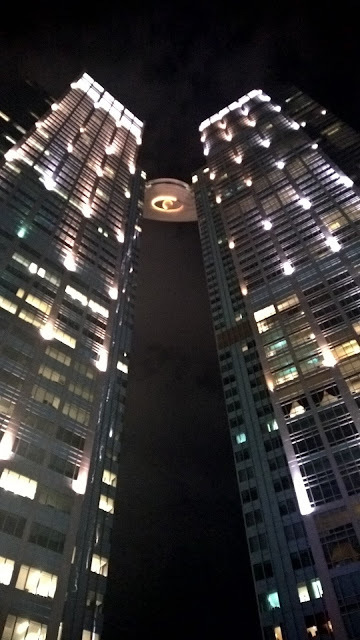 While I walk to the top of the lounge, I already sense a different energy on each level. 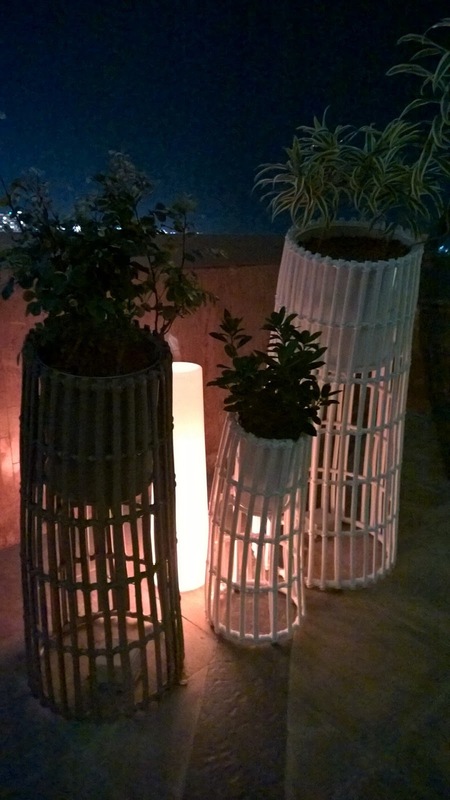 This can only bode well for guests as they seek a corner to reflect their mood. 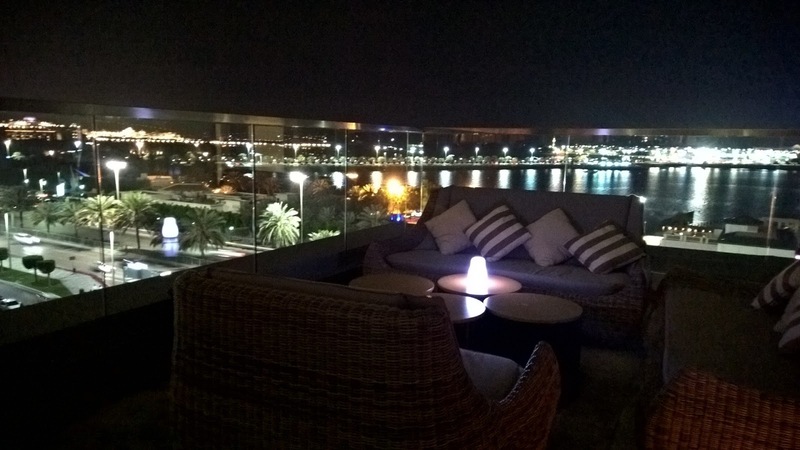 Tonight I am feeling some of that city energy, so I am seated at a table that gives me 180˚ views of the corniche. As we are seated, I immediately remark to my guest that the music is great. He uses the word 'funky' to describe it. It is a Monday night, but the music makes it feel like it could be the weekend. 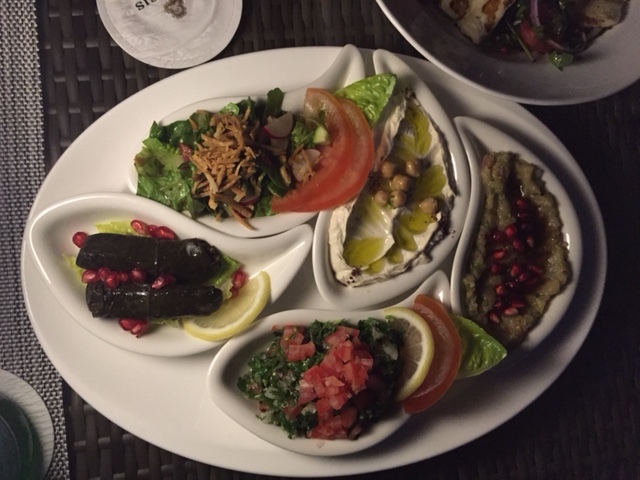 I peruse the menu, and I see a nice balance between drinks and dishes that bring together two favourites in the local market - Arabic and Sushi. The menu has an identity. I always question menus that serve everything and hide behind the word 'International'. The menu here is succinct and focused. After all, it is a lounge, not a full restaurant. As a guest you don't want to think too hard, wading through page after page of a menu. A good start. As I place my order, my drink is served. I am excited because it uses Luc Belaire Rare Rosé as a base - I usually feel a thrill when I spot a bubbly I have not seen before in Abu Dhabi. The bubbly market here is still very immature, and as I have remarked before, you there tends to be the usual choices in restaurants and lounges. The good start continues! While Azura has your usual cocktails, look to the cocktails inspired by this Rosé as the barman uses some magical combinations like Elderflower syrup and passion fruit or the former and mint. Our starters, meanwhile are served. 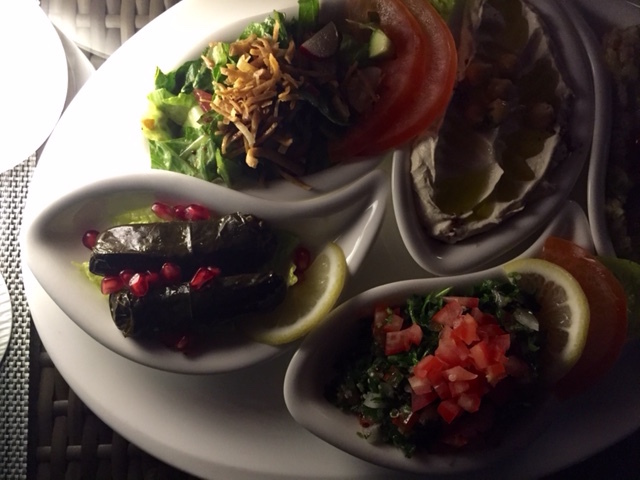 Needless to say, we have ordered a Cold mezze platter, and at 90AED represents excellent value for money. Of the Fatoush and baba ganoush, I am torn as to which is my favourite, but give up the ghost because they each have their virtues - the texture from the fatoush and the extra smokiness from the baba ganoush. 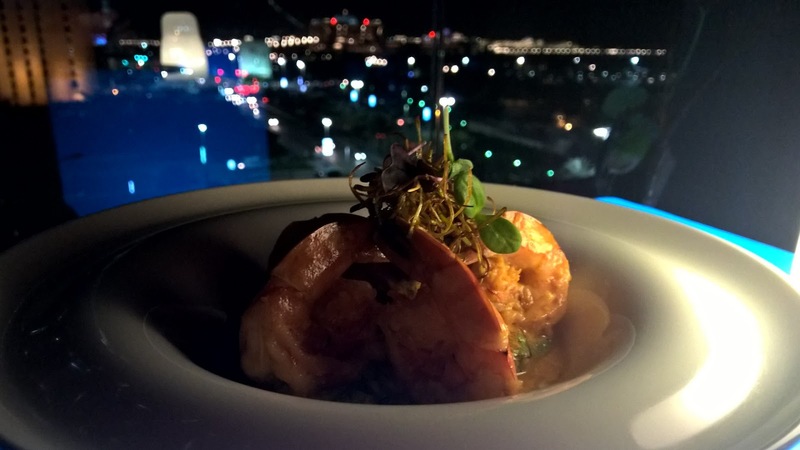 We also try the Chili garlic prawns. It is beautifully presented and also nicely cooked, retaining their moistureHowever, I find them lacking in chili. When you see this item on the menu, you expect it to have a bit of bite, but my guest and I find the prawns a bit bland. On the other hand, the Halloumi salad is outstanding. 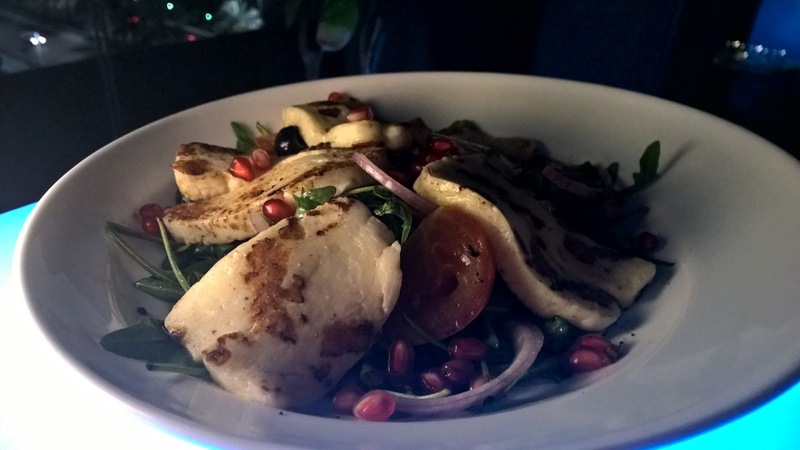 Generously-sized pieces of halloumi cheese seared just enough to give it that brown colour in places is placed on a bed of rucola, onion slices and cherry tomatoes, with a sprinkling of pomegranate seeds. Pomegranate molasses bring a delightful sweet-sourness to bear on the dish and balance the saltiness of the halloumi just right. Highly recommended. We have the pleasure of being waited on by Ali, a young man from Jordan. I appreciate his self-awareness and honesty as a waiter. He also knows his products, making for a very good evening in this regard. In fact, based on my interaction with the restaurant manager, I can see that she puts a lot of time into developing her staff. Four our mains, we have the Salmon maki, Kani tempura maki and Lobster maki. The Salmon maki (not pictured) is the most traditional in taste of the three. Raw salmon inside and salmon torched on the outside give the dish a very good perspective. Next, we try the Kani tempura maki that is packed with texture, but it is the melted Japanese cheese on top that we find most interesting. But it is the last dish that we try that turns out to be our favourite. 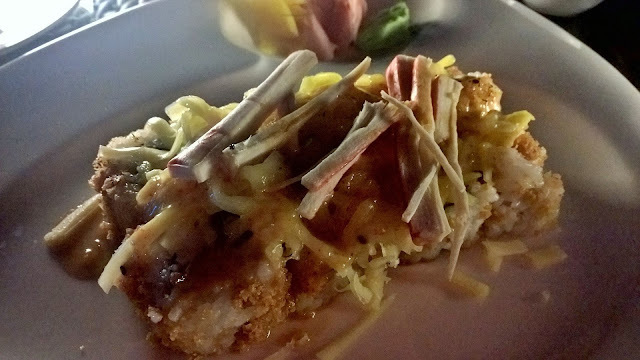 The Lobster maki is proof that you eat before you actually taste food. It privileges the eyes as the most important sense in eating. How can you not love this dish as it is placed in front of you? 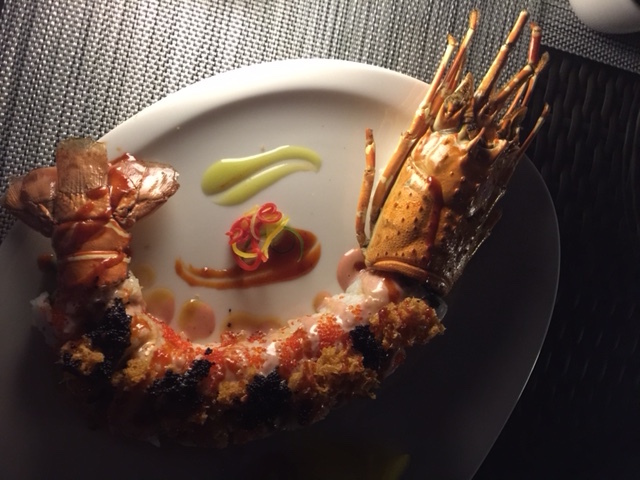 Black and orange tobiko are sprinkled on the middle part of the 'lobster', while the tail and head complete it. Lastly, avocado, mango and strawberry are smartly used to add different flavours. 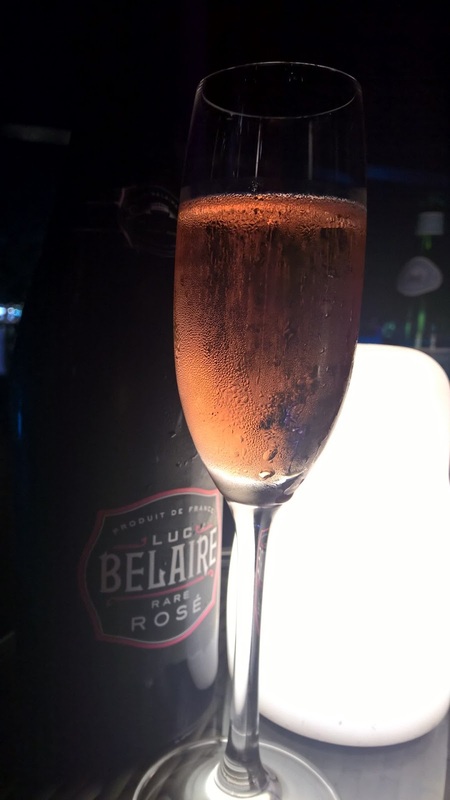 I find tthestrawberry particularly good because it has a two-dimensional taste and adds particularly to my enjoyment of the Luc Belaire Rare Rosé! The Azura Panoramic Lounge is a stunning venue that brings together numerous facets that make a venue great. It would be tempting to serve food that is neither here nor there and bank on the views. While there are guests who would be wowed by the atmosphere and views, I think it important to offer guests food that matches these. That was certainly the case on my visit. The venue counters any suggestions that people may be tempted to make that the St Regis brand is a bit stiff and posh - this is why this is an important outlet for them. The lounge is young and has a cool but not trendy element about it. As I get up from my table, I look towards the sea, see the traffic below and the night sky above, and feel that energy that night brings - but it is tranquility I feel now. There is none of the hustle and bustle of city life. Just peace. Disclaimer: I consult at restaurants and hotels in an attempt to look at the entire product to take service levels to where they should be. I visited Azura Lounge courtesy of the hotel.